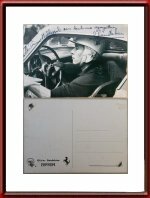 This is an official Ferrari factory issued postcard of Olivier Gendebien at the wheel of what looks to be his Ferrari 250 GT LWB TdF, S/N 0503GT, during the 1956 Mille Miglia in which he would finish 5th overall. Olivier signed and dedicated the card himself on the front. 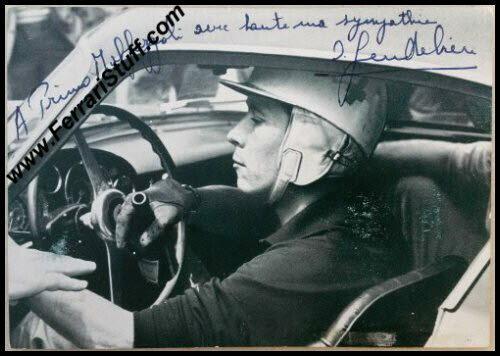 The text reads "A Primo Maffezzoli avec toute ma sympathy O. Gendebien"
The text loosely translates into "To Primo Maffezzoli with all my sympathy, O. Gendebien"
The image of Olivier with the bottle in his right hand while looking at what look to be some notes in truly iconic! The card is in near mint condition, especially considering its age. There is some minor glue residue on the card and the remnants of having been stuck in an album for decades on the back. 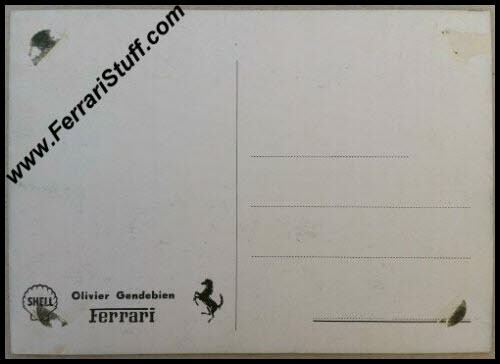 The rear shows the Shell logo, the Ferrari prancing horse, the Ferrari script logo and the text "Olivier Gendebien".